Get the healing power of copper in this copper compression glove. 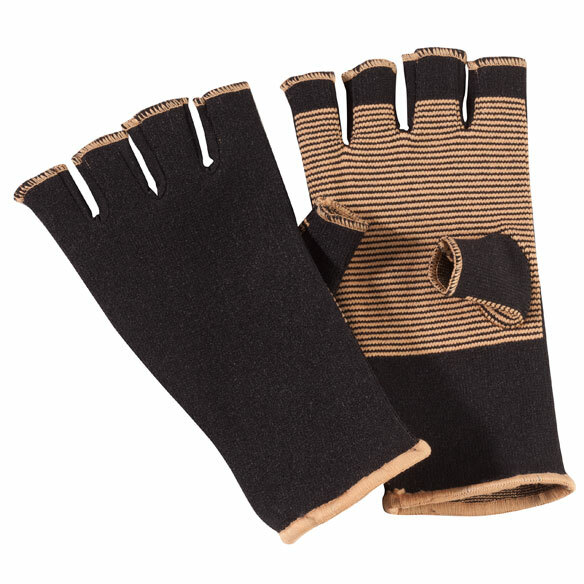 Soft compression gloves feature generous 20% copper thread content to soothe stiff, painful hands and fingers. Copper’s antimicrobial and antibacterial properties help fight bacteria, fungus and odor, and wick away perspiration. Soft compression promotes circulation and healing. Copper compression wear retains body heat for targeted, soothing warmth. Place copper gloves in direct sunlight after wearing to freshen. Machine wash gentle cold; dry flat. 70% bamboo charcoal fiber/20% copper thread/10% elastane. If your hands hurt get a pair! I have joint pain in my hand and fingers. I wear these gloves at night and when I am driving, they keep my hands and fingers from swelling and thus are much less painful. Purchased these as spares for my wife. She has a pair now that she uses every night to relieve pain in arthritic hands. She swears by this product and does not EVER want to be without these gloves. Presenting her with 2 pairs of gloves for her as spares got me a MAJOR ATTA BOY. So far a great product. If I develop hand issues I will get some for myself. Sure help my arthritis in my hands my friends also said it helped them also. 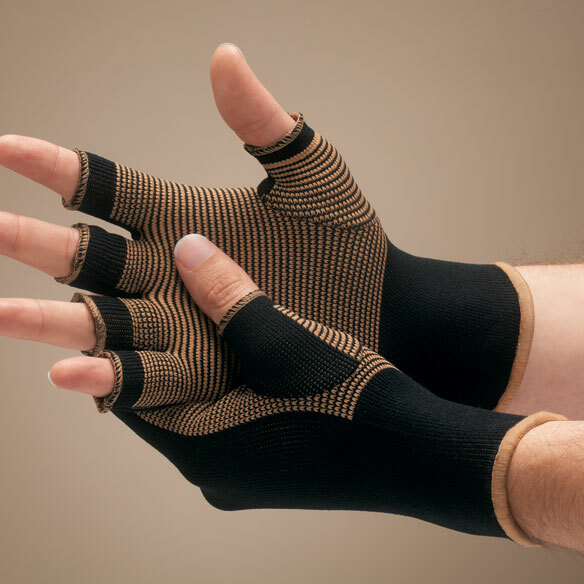 Bought myself and husband pair he uses his as driving gloves an seems to help him.i use mine to help with carpal tunnel it stops the numbness. There tight at first if you have big hands but do stretch a little. Yes i would recommend. Iam going to buy another pair for my sister. My husband really likes these gloves. He said it helps with the swelling in his hands. My granddaughter uses these gloves with her job. They have helped a lot. She really likes them. I have serious arthritis that is very painful and these gloves help alleviate that pain. It does take about 1day for results. I use them when I do a lot of sewing cause I have been sewing for 40 years and now the hands are beginning to give me problems but when I wear these gloves they take the pain right away. I love them. I will be buying more of these gloves. My husband has severe neuropathy and arthritis in his hands and feet. He's tried other compression gloves, but says these are by far the best he's tried. We'll be ordering more. Helps to take away the arthritis pain and keeps my hands warm. Work's very will, this is my second set of gloves..
My husband wants this for his left hand - to help lessen the pain. The description covers all my needs. I'm looking for some way to help my aching hands. Fingers crossed these gloves will help. Husband wants them for pain in his hands. hands hurt constantly. hope this product really works. These gloves have not yet arrived!! I have another pair and I sleep in them. The keep my fingers in piano playing condition. Thought I would try these, and my hands immediately felt better. To get some pain relief. 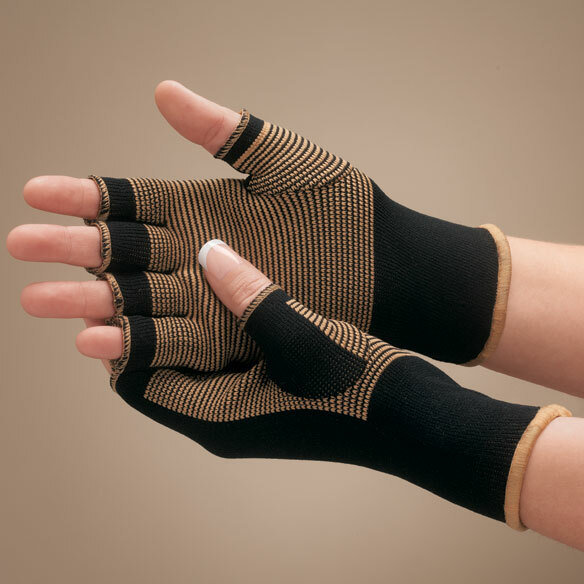 looking for an item to help my hands feel better. Hand therapist recommended this for my hand issue, when driving, in addition to my steering wheel cover. I am hopeful that the copper-wire infused fabric will remain in tact through machine washing and drying better than the copper dots on a different brand. I have other similar gloves and wanted to try the ones with copper to compare. For the compression , not the copper . I like the copper healing idea. lOVE THEM kEEPS MY HANDS WARM. These gloves really relieve the pain in my thumbs. I put them on and get relief almost instantly. Will buy again. trying to find a glove that won't rip as easily as what I am currently using. I was looking for something to help me with my arthritic hands..decided to try them based on the revies. This is what I wanted to purchase. What sizes are available for women? BEST ANSWER: Thank you for your question. The womens are 6 1/2" L and stretches to 9", It has a 5 1/2" wrist circumference and stretches to 6". The middle of the glove will fit a hand up to 7 1/2" circumference. The mens are 7 1/2" L and stretches to 10", It has a 6" wrist circumference and stretches to 6 1/2". The middle of the glove will fit a hand up to 8 1/2" circumference. We hope this information will be of help to you. I have pain ion the top side of my and also fingers and wrist. I only see copper on the palm side, willthis help the top of my hand? The warmth & copper on sides will help. Is this a pair of gloves? BEST ANSWER: Thank you for your question. The Copper Compression Gloves come as a pair. We hope this information will be of help to you. Yes. A pair a compression gloves. Not for warmth. Open finger tips so you can type, or use phone, etc. Will these fit small hands? One size fits all are usually too big for my small hands. BEST ANSWER: I also have very small hands and he small size fit just fine. I use them all the time. How many centimeters in width of mans glove? BEST ANSWER: Thank you for your question. We have included the sizing below for the men's and women's.We hope this information will be of help to you. •6½”L – stretches to 9” including fingertip openings.